The Honda Civic (Japanese: ホンダ・シビック, Honda Shibikku) is a line of cars manufactured by Honda. Originally a subcompact, the Civic has gone through several generational changes, becoming both larger and more upscale, moving into the compact car segment. EPA guidelines for vehicle size class stipulate a car having combined passenger and cargo room of 110 to 119.9 cubic feet (3,110 to 3,400 L) is considered a mid-size car, and as such the tenth generation Civic sedan is technically a small-end mid-size car, although it still competes in the compact class. The Civic coupe is still considered a compact car. The Civic currently falls between the Honda Fit and Accord. The first Civic was introduced in July 1972 as a two-door model, followed by a three-door hatchback that September. With an 1169 cc transverse engine and front-wheel drive like the British Mini, the car provided good interior space despite overall small dimensions. Initially gaining a reputation for being fuel-efficient, reliable, and environmentally friendly, later iterations have become known for performance and sportiness, especially the Civic Type R, Civic VTi, Civic GTi and Civic SiR/Si. The Civic has been repeatedly rebadged for international markets, and served as the basis for the Honda CR-X, the Honda CR-X del Sol, the Concerto, the first generation Prelude, the Civic Shuttle (later to become the Orthia), and the CR-V. In Japan, as customers increasingly shifted to minivans and compact cars like the Fit, production of the non-hybrid Civic ended in August 2010 when it no longer complied with Japanese government dimension regulations in the width category. However, the Civic was reintroduced into the Japanese market with the launch of the tenth-generation model in 2017. After a period of developing idiosyncratic automobiles such as the lukewarmly received domestic Honda 1300, Honda considered pulling out of automobile manufacturing altogether by the early 1970s. However, the more conventional Civic's release in 1972 immediately changed things, thanks to its economy, reliability and low cost in an era of rising fuel prices. Honda's CVCC technology helped it make it affordable, meeting 1970s and early 1980s emission standards without an expensive catalytic converter. The first generation Honda Civic was introduced on 11 July 1972, but sold as a 1973 model in Japan. It was equipped with a 1,169 cc (71.3 cu in) four-cylinder water-cooled engine and featured front power disc brakes, reclining vinyl bucket seats, simulated wood trim on the dashboard, as well as optional air conditioning and an AM/FM radio. The Civic was available as a coupe, both a three- and a five-door hatchback, as well as a five-door station wagon. Due to the 1973 oil crisis, consumer demand for fuel efficient vehicles was high, and due to the engine being able to run on either leaded or unleaded fuel, it gave drivers fuel choice flexibility over other vehicles. The CVCC engine debuted in 1975 and had a head design that allowed for more efficient combustion, and as a benefit the CVCC system did not require a catalytic converter or unleaded fuel to meet 1975 Environmental Protection Agency emissions standards for hydrocarbons and carbon monoxide. The Civic was joined by a platform expansion of the three-door hatchback, called the Honda Accord in 1976. The second generation Honda Civic was introduced in June 1979 as a 1980 model. It was larger, had a more angular shape, and came with increased engine power. All Civic engines now used the CVCC design, which added a 3rd valve per cylinder; this introduced lean burn swirl technology. The base 1335 cc ("1300") engine made 55 hp (41 kW; 56 PS), with an optional 1488 cc ("1500") engine producing 67 hp (50 kW; 68 PS). Three transmissions were offered: a four-speed manual (on base models), a five-speed manual, and a two-speed semi-automatic Honda had previously called the "Hondamatic". The second generation Civic was offered as a three-door hatchback, a four-door sedan, a five-door hatchback and a five-door wagon. The third generation was released in September 1983 for the 1984 model year. The separate five-door hatchback and wagon models were merged into a five-door "shuttle wagon" or "wagovan" sometimes referred to colloquially as a "breadbox" due to its appearance, called the Honda Civic Shuttle. An additional two-seat coupe style—labeled CRX—was introduced, noted for its compact dimensions and light weight. The third generation Civic saw the introduction of the long running four-cylinder D series engine including a new 1.5 L (91.5 cu in) CVCC engine producing 76 HP. 1984 also saw the release of a high-performance Si model for the Japanese market, featuring upgraded suspension and the 1.6 L (97.6 cu in) DOHC ZC engine which was rated at 130 PS (128 HP). Si models were offered in the US as a 3-door Civic Si hatchback and the CRX Si variant with a 91 horsepower (68 kW) fuel-injected SOHC 12-valve engine. A 4WD engine with different transmission mounts was introduced for the first time in 1984, and later upgraded in 1987. It delivered a fuel economy of around 28 mpg highway. The 4WD system was push-button operated until improved in 1987 when the rear wheels would engage automatically once the front wheels lost traction. This new system was called "Realtime" which used a "viscous coupler" connecting two propeller shafts between the front and rear axles. The manual transmission featured a synchronized 6th gear, called "SL", or "Super-Low", which was used for high torque at very low speeds. The "Realtime" idea is still utilized to this day but includes technological improvements since the first system. Starting with 1985, Japanese Civics were now exclusive to Honda Primo, with variants sold at Honda Verno and Honda Clio. A four-door version called the Ballade was built, under agreement, by Mercedes Benz South Africa, models were 1300, 1500, 1500i, and 1600i DOHC 1.6 injection. In September 1987, a redesigned Civic was introduced with increased dimensions and a lower hood line. A wide range of models and trim levels were offered for various markets around the world. The most notable of which was the Japanese market SiR (featuring the B16A DOHC VTEC engine). All U.S. models featured electronic fuel injection, but carbureted models were still available elsewhere. The fourth generation saw the introduction of a fully independent rear suspension across the entire model range. In addition, the Honda CRX continued to be part of the Civic family which included the HF, DX, and Si model in the U.S.A / four door version called the Ballade was built, under agreement, by Mercedes Benz South Africa / models were 1500 16v, 1600i 16v, and 1600i 16v DOHC. The first 800 cars produced at the then brand new Honda Plant in Alliston Ontario Canada were SE model cars. These Special Edition models included all white side molding that matched the white body and color matched dual mirrors. In the body molding was a wrap around blue stripe. Each car had interior upgrades as well as a chrome tipped exhaust. Introduced in September 1991 for the 1992 model year, the redesigned Civic featured increased dimensions, as well as more aerodynamic styling. The wagon variant was now only available in the Japanese market where the previous generation wagon was carried over until 1995. The efficiency of the previous HF model was replaced by the VX hatchback which, with an EPA rating of 48/55 MPG, was Honda's most fuel efficient model sold at the time. In North America the Si featured a SOHC VTEC valve train, whereas the VX featured the VTEC-E. The Japanese Si featured a DOHC non-VTEC valve train D16A9. Continuing in the sporty tradition of the original Civic SiR, Honda sold several similarly equipped variants of the fifth generation car, still referred to as the Civic SiR, in Japan, Asia, and Europe. In South Africa, MBSA (Mercedes Benz of SA) built the Civic as the Ballade only in 4dr. A special model was the 180i with the B18B4, that was fitted to Ballade models. A new bodystyle was introduced with this generation called the Civic Coupe, based from the Civic Ferio sedan, and was sold in North America, Europe and Japan. The fifth generation remains popular among tuners and racers alike. Introduced in September 1995 for the 1996 model year, the sixth generation featured updated styling although less radical than previous redesigns. Suspension and engine options were available along with their first Natural Gas Powered Civic, the GX. In the US, model year 1996 to 2000 the Civic was sold under the CX, DX, EX, EXR, HX, LX, and for Canada, SE, and Si trims; all base models were made with 1.6-liter engines. The EX-CX are all SOHC (Honda D engine). The CX, DX, and LX all have D16Y7 non-VTEC engines; whereas the EX has a D16Y8 VTEC, and the HX has D16Y5 VTEC-E. The USDM Si and Canadian SiR came with a DOHC (B16A2 VTEC). The first Civic Si coupe EM1 was introduced in 1999 until 2000. Europe saw a DOHC 1.6 VTi hatch and sedan and a DOHC 1.8L engine was available for the Domani related five-door liftback and estate. The seventh generation was released in September 2000, for the 2001 model year. While the redesign retained the previous generation's exterior dimensions, interior space was improved in part by using a flat rear floor thus bumping up Civic to a compact car size segment. The front suspension was changed from that of a double wishbone to a MacPherson strut, in order to lower costs, as well as allow more engine bay room for the newly introduced Honda K-series engine. Power was also increased on some trim levels. The four main trim levels were DX, LX, EX, and HX. The Civic Coupe was no longer sold in Japan starting with this generation. In North America, coupe and sedan body styles were available, except for the Si (SiR in Canada) which was offered only as a three-door hatchback. The rest of the world received three and five-door hatchbacks. The Type R was redesigned as well this time using a more powerful i-VTEC motor and using the three-door hatchback body style. 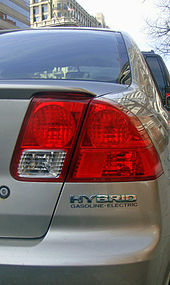 This generation saw Honda introduce their first Civic Hybrid, powered by a 1.3-liter engine. The eighth generation was released in September 2005, for the 2006 model year. For the eighth generation, Honda split the model into two different platforms, one for sedan and coupe, and one for a hatchback designed primarily for the European market using a simpler rear suspension from the Honda Fit and more aggressive styling. As of 2006, a total of 16.5 million Civics had been sold worldwide, with 7.3 million of them in the United States. Although the North American and the home market model differ externally, they are mechanically identical. The hatchback is available as a three and five-door. Both Si and Type R trim levels continued although the Japanese and European Type R, while sharing the same engine size, are mechanically different. In the US, an improved, sportier version of the Civic Si 4-door tuned by tuner Mugen was offered, featuring cosmetic alterations and changes to the suspension, wheels, slight exterior differences, and exhaust system. A Canadian only Acura model received a new nameplate, changing from the Acura EL to the Acura CSX. The end of this model generation also marked a hiatus of the Civic Type R in Japan, with no successor model until the later tenth generation, going on sale mid-2017. The tenth generation Civic is based on an all-new Honda compact global platform. The sedan was first unveiled in September 2015, for the 2016 model year. The interior of the new Civic likewise features major design changes. Unlike the split bi-level speedometer and tachometer of its predecessor, the EX and above trim levels of the tenth generation Civic consolidates these instruments into a fully customisable, all digital "Driver Information Interface" incorporating a 7-inch LCD screen positioned directly behind the steering wheel and in the driver's line of sight. The LX trim instrumentation consists of a large analog tachometer that surrounds a digital speedometer and other digital displays. Civic variants include sedan, coupe, five-door hatchback, Si trims, and Type-R models. The 2017 Civic Si also features adaptive dampers, stiffening of other suspension components, including mounting points, anti-roll bars, springs and bushings. The Civic has been sold in Brazil since late 2006 with a flex-fuel engine capable of running on either gasoline or ethanol or any blend of both. While the Civic is sold in largely the same form worldwide, differences in the name of the models exist between markets. In Japan, the hatchback Civic is just called "Civic" while the sedan model was called the Civic Ferio (Japanese: シビックフェリオ) during the fifth to seventh generations. The sixth-generation sedan was also sold as the Integra SJ. In Europe and the United States, "Civic" generically refers to any model, though in Europe the coupe is branded the "Civic Coupe". A four-door station wagon model called the Civic Shuttle (also Civic Pro in Japan) was available from 1984 until 1991 (this brand name would later be revived for the mid-1990s Honda Shuttle people carrier, known in some markets as the Honda Stream). In South Africa, the sedan (the only model sold there until the 1996 launch of the sixth generation sedan and hatch) was known as the Ballade. Other models have been built on the Civic platform, including Prelude, Ballade, CR-X, Quint, Concerto, Domani, CR-X Del Sol, Integra, and CR-V.
Also, at various times, the Civic or Civic-derived models have been sold by marques other than Honda – for example, Rover sold the 200, 400 and 45, each of which were Civic-based at some point (first 200s were the second generation Ballade; from 1990 the 200 and 400 were based on the Concerto; the 400 was the 1995 Domani), as was their predecessor, the Triumph Acclaim, based on the first Honda Ballade. The Honda Domani, an upscale model based on the Civic, was sold as the Isuzu Gemini in Japan (1992–2000), and confusingly the 5-door Domani was sold as the Honda Civic (along with the "real" hatchback and sedan Civics) in Europe from 1995 to 2000. In Thailand, the sixth generation Civic was available as the four-door Isuzu Vertex. The sixth-generation station wagon was sold as the Honda Orthia, with the Partner as the downmarket commercial variant. The seventh generation minivan model is called the Honda Stream. In Canada, the sixth and seventh generation Civics were mildly redesigned to create the Acura EL until the advent of the eight generation Civic, which was used to create the Acura CSX, which was designed in Canada. Honda Japan adopted the CSX styling for the Civic in its home country. Ninth-generation Honda Civic GX (U.S.) with the blue diamond CNG sticker and the new natural gas badging. The three-door hatchback body style has been somewhat unpopular in the United States, but has achieved wide acceptance in Canada, as well as popularity in Japan and European markets, helping cement Honda's reputation as a maker of sporty compact models. Starting in 2002, the Civic three-door hatchback has been built exclusively at Honda's manufacturing plant in Swindon, England – previously the five-door Civic/Domani and the Civic Aerodeck (based on the Japanese Orthia) were built in this plant for sale in Europe along with the Japanese Civics. Accordingly, all instances of the current model (left or right hand drive, anywhere in the world) are British-made cars designed with Japanese engineering, except for the US-built two-door coupe and the sedan version built in Brazil for the Latin American market. In North America, the Civic hatchback was dropped for 2006. The 2006 model year standard Civics for North America are manufactured in Alliston, Ontario, Canada (sedans, coupes and Si Coupes) and East Liberty, Ohio (sedans), while the Hybrid version is manufactured in Japan. In Brazil, although being considered for local manufacturing since the early 1980s (it was illegal to import cars in Brazil from 1973 until 1990), the Civic wasn't available until 1992, via official importing. In 1997, production of the sixth generation Civic sedan started in the Sumaré (a city near Campinas, in the state of São Paulo) factory. The only differences between the Japanese model and the Brazilian model were a slightly higher ground clearance, due to the country's road conditions and adaptations to make the engine suitable to Brazilian commercial gasoline, which contains about 25% ethanol (E25), and the absence of sunroof in the Brazilian sixth generation Civic EX. The seventh generation production started in 2001, displacing the Chevrolet Vectra from the top sales record for the mid-size sedan segment, however it lost that position to the Toyota Corolla the following year. In 2006, the eighth generation was released and regained the sales leadership. Identical to the North American version, it lacks options such a moonroof, and standard security equipment like VSA and side and curtain airbags were removed due to lack of car safety laws in the Mercosur. Furthermore, the Brazilian subsidiary began producing flex-fuel versions for the Civic and the Fit models, capable of running on any blend of gasoline (E20 to E25 blend in Brazil) and ethanol up to E100. The National Highway Traffic Safety Administration (NHTSA) in the United States has determined frontal crash test ratings of Honda Civics of different model years. 1994–1995 Honda Civic 2-DR 2,498? The eighth-generation Civic sedan's crash test performance has been rated highly by both the US government's NHTSA and the Insurance Institute for Highway Safety. The IIHS awarded the Civic sedan with a rating of "good" on both frontal and side impact crash tests and lists the Civic as the second-best 2007 small car in overall crashworthiness. The Civic coupe is rated "acceptable" in the side impact test. In Australia, 1984–2005 Civics were assessed in the Used Car Safety Ratings 2006 on their level of occupant protection regardless of size or era. (1984–1987) – "significantly worse than average"
(1996–2000) – "better than average"
Despite being a modest car, the Civic is popular as a platform for modification and customization by the enthusiast community. Starting with the fourth generation and continuing through the 2000 model year, Civics had front double wishbone suspension and rear semi-trailing arm suspension. Ready parts interchangeability allows easy engine swaps (primarily with more powerful B16A (Civic SI), B18C (Acura Integra GSR), and various K20 Civic motors) and many other upgrades. More recent seventh and eighth generation Civics, now rated as compacts rather than subcompacts, remain generally attractive as tuner projects in spite of added weight (mostly due to U.S. government safety mandates, such as airbags and ABS) and higher centers of gravity. Particularly unwelcome among the tuner community was the replacement of the front double-wishbone suspension with MacPherson struts, which provide inferior handling primarily due to limited dynamic camber angle control. Honda Civic EX was International Car of the Year in 2005. From 1972 to 1974, the Civic was awarded Car of the Year Japan. In 1973, the Civic ranked third in the European Car of the Year awards, the highest ranking for a Japanese vehicle at that time. It also was awarded the U.S. Road Test magazine's "1974 Car of the Year." The Civic was the Motor Trend Import Car of the Year for 1980 as well as its 2006 Car of the Year. In 2006, the Civic earned the 2007 "Semperit Irish Car of the Year" title. In 1996, Automobile Magazine honored the Civic as its Automobile of the Year. The Civic has been on Car and Driver magazine's yearly Ten Best list six times, in 1985, 1988–91, and 1996. The Civic Si was named "Best New Sport Car" and the sedan was named "Best New Economy Car" in the 2006 Canadian Car of the Year awards. The Civic also won the North American Car of the Year and the North American International Auto Show (NAIAS) Car of the Year awards for 2006. In November 2006, the Civic received the prestigious "Car of The Year" award from Brazilian magazine Auto Esporte. The four-door Civic VXi sedan won the South African Car of the Year award for 2007. Civics have been used for racing ever since their introduction. Civics contested the Up to 1300cc class in the Bathurst 1000 touring car race at Bathurst in Australia each year from 1973 to 1976, with a best placing of second in class in both 1974 and 1976. In recent years the Civic has been used in a wide variety of racing series, particularly in Japan. It is also used in touring car races in Europe and the United States. The Civic has been used in the UK in endurance series by teams such as Barwell Motorsport and Cartek Motorsport. In 2002 JAS Motorsport entered the European Touring Car Championship (ETCC) with a Super 2000 spec Civic and was used until restart season of the World Touring Car Championship (WTCC) in 2005. In December 2005, on the date of the new 2006 Civic Si's launch in the United States, Honda's R&D Engineering Team completed 645 laps in an eighth generation Civic Si coupe (FG2) to place first in the E1 class of the famous '25 Hours of Thunderhill' marathon race. The drivers on Honda's team were Road & Track journalist Kim Wolfkill, Lee Niffenegger, Chad Gilsinger, Sage Marie, John Sherk, Rich Hays, Andrew Frame, Matt Staal and Car and Driver journalist Tony Swan. In the UK, the Civic has been used in the British Touring Car Championship (BTCC) for several years and is still highly competitive. The Civic Type R made its debut in the 2002 season with the 'Works' team run by Arena Motorsport. Built to BTC-T specifications, it gained the team third in the manufacturers championship. In the same year Synchro Motorsport won the BTCC Production Teams Championship with a pair of Civic Type Rs. The 2003 season saw the 'works' team Civics secure an impressive second in the manufacturers championship. The 2003 BTCC Production Teams Championship also went to the Civic again, this time in the hands of Barwell Motorsport. Such was the competitiveness of the Civic in its first two-season, 2004 saw five teams enter Civics, allowing the model to secure second in the manufacturers championship. Although manufacturer support from Honda for the BTCC ended in 2005, several teams still found success running the Civic in 2005 and 2006. For the 2007 BTCC season, Team Halfords ran the new eighth-generation Honda Civics, built to the latest S2000 regulations, for Matt Neal and Gordon Shedden with limited success and continued to use the Civic into the 2008 and 2009 season. In both 2007 and 2008, the Civic allowed the team to finish 3rd in the Teams championship, behind the two manufacturer backed teams. In 2010 Honda returned to the BTCC as a 'works' team with Team Dynamics using Civics to win the 2010 manufacturers championship. In 2011 the team returns with its Civic to defend its Team and Manufacturers championship again with the Neal and Shedden pairing. Honda Racing Team swapped to the brand new ninth generation Honda Civic, built fully to NGTC rules, for the 2012 BTCC season. They are the first manufacturer backed team to announce their intention to run fully to the NGTC specification. The drivers continue to be Matt Neal and Gordon Shedden, who are the 2011 and 2012 BTCC driver champions respectively. Andrew Jordan, driving for his family-run Eurotech Racing team, won the BTCC title in 2013 in their NGTC Civic, whilst Honda retained the manufacturer's championship. However, in 2014, Honda were unable to retain their title, which was won instead by MG.
Honda won the 2013 World Touring Car Championship Manufacturers' Championship. Honda announced plans to enter the 2012 World Touring Car Championship (WTCC) with a racer built on the 2012 Euro Civic five-door hatchback. The car is powered by a 1.6-liter turbocharged engine, developed by Honda R&D, and would later race in Japan, China and Macau before a two car team joined the 2013 championship racing. Honda won the 2013 Manufacturers' Championship in their first full season in the series, six races before the end of the season. However, Honda was unsuccessful in defending their title in 2014, as Citroën dominated the series in their first season. The car has also been used in the Japanese Touring Car Championship, and won the 2011 Asian Touring Car Series. It also competed in both the Touring and Super-production classes of the Russian Touring Car Championship. As of February 2015, 18.5 million Civics had been sold worldwide. With 7.3 million bought in the United States, it has been a top seller both there and in Canada, where it had placed No. 1 for 14 years through 2012. ^ "2016 Honda Civic Sedan Press Kit – Interior" (Press release). American Honda Motor Company. 18 October 2015. Retrieved 29 July 2016. ^ "History of Civic First Generation". Honda. ^ "The Honda Civic – A legend, a time capsule on wheels". Gaadi. ^ "2006 Honda Civic Expert Review". Cars.com. ^ "2006 Honda Civic Review". JB car pages. Retrieved 2 August 2008. ^ Takahashi, Yoshio (16 November 2010). "Honda to End Civic Sales in Japan". The Wall Street Journal. Retrieved 28 December 2010. ^ Radu, Mihnea (27 July 2017). "2017 Honda Civic Hatch and Sedan Launched in Japan". autoevolution. ^ Wolfcale, James. "The Top Ten Hondas of All Time". DriveCult. Retrieved 26 September 2012. ^ "Inside Line: Honda Civic". Edmunds.com. Archived from the original on 1 March 2009. Retrieved 29 November 2014. ^ "2003 Honda Civic Review". JB car pages. Retrieved 29 November 2014. ^ "2003 Honda Civic Hybrid Review". JB car pages. Retrieved 6 March 2009. ^ a b Collier, Joe G. (1 June 2006). "Honda getting its groove back with Civic". Detroit Free Press. Retrieved 16 October 2011. ^ Omar Rana (5 April 2011). "Honda targeting 12% increase in April sales despite vehicle shortages". egmCarTech. ^ Stoklosa, Alexander (12 November 2012). "Honda Releases First Images of Redesigned 2013 Civic Sedan Ahead of Debut [2012 L.A. Auto Show]". Car and Driver. Retrieved 23 April 2016. ^ Boudette, Neal E. (1 April 2015). "Honda Readies 'Epic' Civic with American Pedigree". Automotive News. Crain Communications. Retrieved 12 September 2015. ^ "Honda Civic Sedan (2016)". ^ Siler, Steve. "2017 Honda Civic First Drive Review". Car&Driver. Retrieved 3 February 2019. ^ Gall, Jared. "2017 Honda Civic Coupe Test Review". Car&Driver. Retrieved 3 February 2019. ^ "HUM: Civic". Honda of the UK. Archived from the original on 5 November 2004. Retrieved 29 November 2014. ^ "Honda Civic atinge 300 mil unidades produzidas" (in Portuguese). Honda Brazil. September 2008. Archived from the original on 16 November 2008. Retrieved 7 September 2008. ^ "Archived NHTSA crash test results from Crashtest.com". Archived from the original on 16 August 2000. Retrieved 3 December 2015. ^ "5-star Safety Ratings 1990–2010". SafeCarGuide.com, Inc. Retrieved 3 December 2015. ^ a b "2009 Honda Civic DX (M5) Sedan Ratings, Prices, Trims, Summary". J.D. Power. Archived from the original on 4 December 2014. Retrieved 29 November 2014. ^ "IIHSHLDI: Honda Civic". IIHS. Archived from the original on 1 April 2007. Retrieved 9 June 2007. ^ "IIHSHLDI: Small cars – Current". IIHS. Retrieved 9 June 2007. ^ "IIHSHLDI: Honda Civic 2-door". Iihs.org. 21 July 2009. Retrieved 23 August 2009. ^ "Used Car Safety Ratings". Vic Roads. Archived from the original on 14 October 2008. Retrieved 5 November 2006. ^ Bonk, Aaron (1 February 2007). Honda Engine Swaps. CarTech Inc. p. 8. ISBN 9781932494563. ^ "Has Honda Lost Its Way?". insideline.com. ^ "How Car Suspensions Work". howstuffworks.com. ^ "Suspension Design: Types of Suspensions". automotivearticles.com. ^ "First Generation (1972)". Honda Worldwide. Retrieved 5 November 2006. ^ "Second Generation (1972)". Honda Worldwide. Retrieved 5 November 2006. ^ Waterman, Stuart (6 December 2005). "Honda Civic Si scores class win in 25 Hours of Thunderhill – Autoblog". Autoblog.com. Retrieved 24 October 2010. ^ "Honda sticks to a winning team". btcc. 22 October 2010. Archived from the original on 19 September 2011. Retrieved 17 June 2011. ^ Andrei Tutu (2 September 2011). "New Honda Civic 2012 BTCC Race Car Under Development". AutoEvolution. ^ "All new Civic for 2012". British Touring Car Championship. TOCA. 1 September 2011. Archived from the original on 18 March 2012. Retrieved 1 September 2011. ^ Mihnea Radu (16 September 2011). "Honda Racing 2012 BTCC Drivers Confirmed". AutoEvolution. ^ Noah Joseph (19 October 2011). "att Neal takes the British Touring Car Championship for Honda". Autoblog. ^ "2013 BTCC season review – picture special". Autocar. 14 October 2013. Retrieved 21 December 2014. ^ "MG and Triple Eight take Manufacturer's crown at action-packed Brands finale". British Touring Car Championship. 14 October 2014. Retrieved 21 December 2014. ^ Steven Ewing (3 February 2012). "Honda to enter World Touring Car Championship with new Civic". Autoblog. ^ "WTCC – WTCC debutants Honda win Manufacturers' Championship". Yahoo Eurosport UK. 9 September 2013. Archived from the original on 23 December 2014. Retrieved 21 December 2014. ^ "Standings – 2014 Manufacturers' Championship". FIA World Touring Car Championship. Retrieved 21 December 2014. ^ "WTCC: Citroen, you don't change a winning team". racecar. 16 November 2014. Retrieved 21 December 2014. ^ "History's 10 Best Selling Cars Of All Time". Autoblog. Retrieved 2016-10-09. ^ Krisher, Tom (19 August 2010). "Why Honda is growing as Detroit falls behind". San Francisco Chronicle. Retrieved 16 October 2011. ^ "Fuel-efficiency pays off for Honda". The Washington Times. 19 September 2009. Retrieved 16 October 2011. ^ "Best Selling Car in Every State". Business Insider. 21 November 2013. Retrieved 7 June 2014. ^ Duarte, Joe (5 January 2011). "Canada's most popular car 13 years running". Autonet.ca. Archived from the original on 7 January 2011. Retrieved 16 October 2011. Wikimedia Commons has media related to Honda Civic.